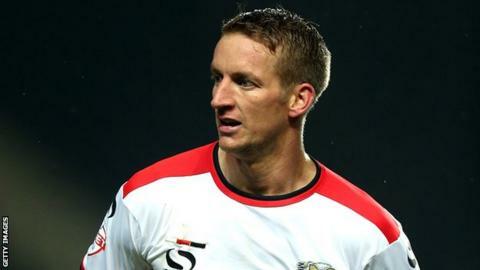 MK Dons kept their League One automatic promotion hopes alive with three second-half goals against Doncaster. Dean Bowditch put the hosts ahead with a fortunate finish as a clearance bounced off his head and looped in. Carl Baker showed some fine footwork in the box before smashing in a second and then rounded off the win with a slotted finish into the bottom right corner. Karl Robinson's Dons remain a point behind second-placed Preston North End with two league games to go. Match ends, MK Dons 3, Doncaster Rovers 0. Second Half ends, MK Dons 3, Doncaster Rovers 0. Dele Alli (MK Dons) wins a free kick on the right wing. Corner, MK Dons. Conceded by Mitchell Lund. Attempt missed. Kyle McFadzean (MK Dons) right footed shot from outside the box is too high. Corner, MK Dons. Conceded by Dean Furman. Goal! MK Dons 3, Doncaster Rovers 0. Carl Baker (MK Dons) right footed shot from the right side of the box to the bottom left corner. Assisted by Dele Alli. Goal! MK Dons 2, Doncaster Rovers 0. Carl Baker (MK Dons) right footed shot from the right side of the box to the top right corner. Assisted by Dele Alli. Attempt missed. William Grigg (MK Dons) left footed shot from the left side of the box is just a bit too high. Attempt saved. Carl Baker (MK Dons) left footed shot from the right side of the box is saved in the centre of the goal. Corner, Doncaster Rovers. Conceded by David Martin. Curtis Main (Doncaster Rovers) wins a free kick in the defensive half. Substitution, Doncaster Rovers. Curtis Main replaces Nathan Tyson. Substitution, Doncaster Rovers. Jonson Clarke-Harris replaces Luke McCullough. Attempt missed. Dean Furman (Doncaster Rovers) right footed shot from the left side of the box misses to the right. Goal! MK Dons 1, Doncaster Rovers 0. Dean Bowditch (MK Dons) header from the right side of the six yard box to the top right corner. Assisted by Jordan Spence. Substitution, MK Dons. Dean Bowditch replaces Lewis Baker. Attempt missed. Dele Alli (MK Dons) right footed shot from outside the box is just a bit too high. Attempt blocked. William Grigg (MK Dons) left footed shot from the left side of the box is blocked. Luke McCullough (Doncaster Rovers) wins a free kick on the right wing. Attempt missed. Antony Kay (MK Dons) left footed shot from outside the box is too high.